Ask Charmayne | What Is Laser Genesis? Q: What Is Laser Genesis? A: Well, I can’t start this Q& A off without saying how much I LOVE Laser Genesis. I recommend this treatment to just about every client who comes to see me; especially if they have an event coming up soon (even that weekend) because most people see results right away. And this service is one of our favorite treatments at Renew – not just for you the client – but I personally use Laser Genesis for my skincare routine + maintenance. Ok, enough about me and my love for Laser Genesis – let’s find out WHY I love this skincare treatment so much and think you will too! Laser Genesis is a non-invasive laser treatment that helps restore and smooth out skin tone and texture as well as reduce acne scarring, fine lines and wrinkles, redness, pore size and can aid in the treatment of active acne. The Laser Genesis’s heat-based laser boosts collagen growth and loves to work on treating acne scars and rosacea. WHO IS LASER GENESIS FOR? The short answer: just about anyone! 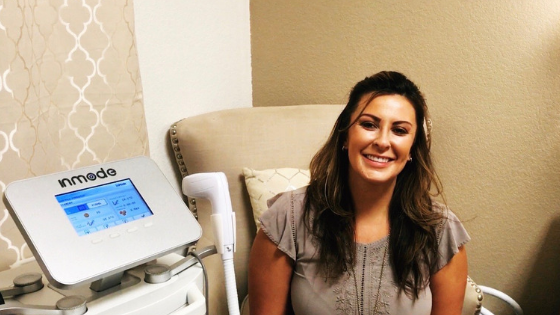 If you struggle with acne, acne scarring, rosacea, large pores or desire an overall refresh of your skin tone and texture – without going under the knife – Laser Genesis is for you. Of course, there are always exceptions when it comes to certain skin types that Laser Genesis may not be useful for, so please speak with your skin care expert. Laser Genesis can be done on the face, neck and chest and depending on the area you’re receiving this treatment, the appointment is typically around 30-45 minutes. Most people report that Laser Genesis is not painful – only a warm sensation is felt. And yet, another reason why we love this treatment: zero downtime and recovery. Now, taking into consideration your skin type and desired results, multiple treatments (3-5) of Laser Genesis (spaced out over 4+ weeks) is recommended. WHAT RESULTS FROM LASER GENESIS CAN I EXPECT? With this lunchtime laser treatment, you can potentially see results right after receiving Laser Genesis. However, the most optimal results and benefits are seen within 3-6 months (and oftentimes, beyond that timeframe). Maintenance for results – especially if being treated for pigment and rosacea challenges – are highly recommended every 6-12 months. Protecting yourself from the sun and maintaining a consistent skincare regimen at home can also help extend your results from Laser Genesis. Series of 6 treatments with 1-2 touch-ups on cheek area. What I’m trying to say is — you know that really trustworthy best friend you call upon when life’s getting you down and who always has golden nuggets of wisdom to share? That’s a lot like our BFF Laser Genesis: totally there for you when you’re at your wits end with your skin, shows up consistently for you with treatments and helps you feel all warm and fuzzy (outside + inside…because laser and confidence!). Ready to get to know your skin BFF, Laser Genesis? PS — Have a question for Charmayne or Dr. Elijah? Simply email (renewpuebloco@gmail.com) with your question and we’d love to answer and feature them in our monthly Ask Dr. Elijah/Ask Charmayne articles. (And don’t worry, we won’t use your name; it’s all anonymous.). Subscribe & Don't Miss The RENEW NEWS! What if we said NASA plays a major role in your skin care? Yes. We are so on the same page. And that’s why we want to tell you that NASA has your back when it comes to anti-aging and acne. So, what does NASA have to do with your skin care? Welcome to the innovation of Celluma light therapy – a skin care alternative. Celluma is an all-in-one low-level light therapy -- cleared by the FDA and backed by clinical research -- devised for anti-aging and acne skin care. “In the same way that plants use chlorophyll to convert sunlight into plant tissue, high intensity light emitting diodes (LEDs) utilizing specific, proven wavelengths of light can trigger a natural biostimulatory effect in human tissue. Research has shown that phototherapy can increase circulation, accelerate tissue repair, kill acne bacteria, decrease inflammation, improve skin tone, texture and clarity, as well as ease muscle and joint pain, stiffness, spasm, and arthritis. Research indicates that cells absorb particles of light (photons) and transform their energy into adenosine triphosphate (ATP), the form of energy that cells utilize. The resulting elevation of ATP is then used to power metabolic processes; synthesize DNA, RNA, proteins, enzymes, and other products needed to repair or regenerate cell components; foster mitosis or cell proliferation; and restore homeostasis. Acne Treatment -- diminishes acne bacteria, clears existing breakouts and restores skin's healthy appearance. Anti-Aging -- increases collagen and elastin production, reduces the look of fine lines and wrinkles and improves firmness and resilience of skin. Dr. Rochelle Elijah and Charmayne Trujillo are proud to have Celluma at Renew and be the first to bring this service to Pueblo, Colorado. We are extremely excited to offer this cutting-edge service for our clients -- especially those with stubborn acne and anyone looking for new and alternative ways to support the anti-aging process. Celluma can be done in a series of treatments (twice a week for six weeks) and the anti-aging and acne component can be an add-on for facials we provide. 1. Call RENEW, today, to get started -- 719.423.0083. 2. Join our email list! Don't miss out on our 2-3 emails we send out monthly -- packed with our blogs, specials, features and Q&A's from Dr. Elijah and Charmayne.